A thread looking at some of the western USA beacons on 8 MHz. This may include harmonics of intended 4 MHz beacons. If you find these detailed reports useful or interesting, please take a moment to reply with any comments. Below: Here's a waterfall image around 8192 kHz with the three signals logged at 2342UTC 25AUG2018. Very interesting, thanks for sharing. I'm on the east coast, and may give this a try , in the early evening here, when I might get propagation to the west coast on 8 MHz, especially a little later in the year. Note: this "D" beacon was previously reported by: mark-n-nut on June 27, 2018. see previous post. 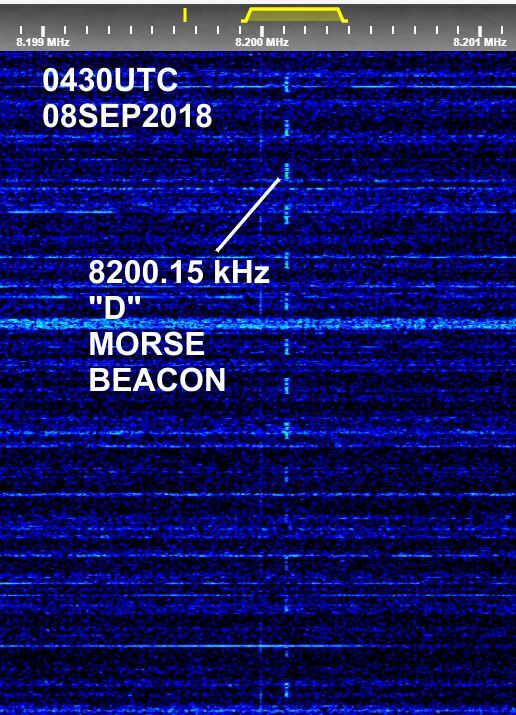 While looking for 4 MHz beacon harmonics, this "D" Morse Beacon was found on 8 MHz. 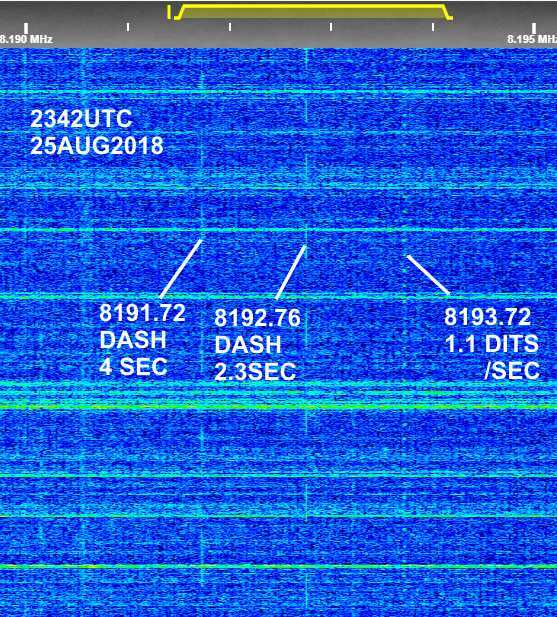 No other "D" beacons were copied today on 4 MHz. The "H" beacon could clearly be heard simultaneously on 4100.05 kHz, which is just about half the frequency of 8200.15 but not exactly. 2001 UTC 2018 NOV 06, local high noon. 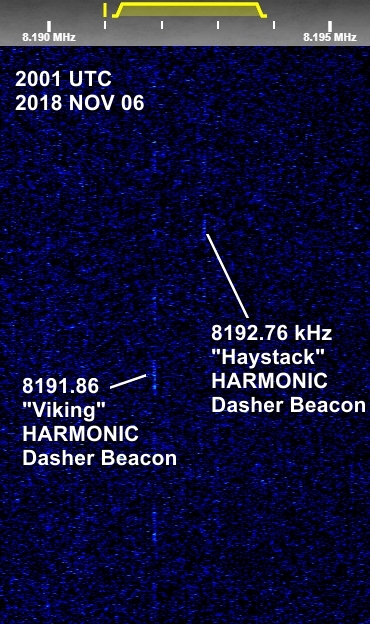 8192.71 kHz, CW, "Haystack", dasher beacon, (harmonic of 4096.35 kHz fundamental) , good readable, -120 dBm. Note: Both beacons were also received simultaneously on their 4 MHz fundamental frequencies. Logging these itsy bitsy emitters is a dirty job. Totally serendipitous, being located at just the right NVIS distance to hear a milliwatt pin drop out there in the high desert. Sorry to rub it in, Chris. But, the shoe is on the other foot, for those elusive east coast pirate stations that you seem to catch with amazing frequency.